Have you ever hit on a man at the bar? The thought has probably crossed your mind but you were probably unsure how to do it without looking like a total loser. Most guys say that they like it when women come up to them first, but yet not too many women actually do it. 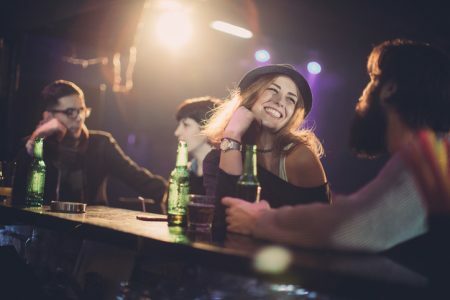 So how can you flirt with a guy at a bar without making him think you’re a crazy weirdo? Try these tips next time you’re out and report back. And also check out the guy's version and give us your thoughts. If you see a cute guy who's eyeing you while you're eyeing him back, just wave him over. You’ll get the points for making the first move without revoking his man card. This makes it seem like he’s making the first move even though you helped as well. That way, you won’t look overly aggressive and you can start a conversation once he comes over. This tactic is sneaky, but totally effective. Go ask the guy you like to take a picture of you and your friends. It is an easy way to start a conversation without making it obvious that you’re interested. Once he snaps the picture, thank him and then start a chat. A simple 'How are you?’ should do and then he’ll probably take it from there if he’s interested. If cheesy lines don’t work on girls, they absolutely don’t work on guys! The best way to make yourself look thirsty AF is to go up to a guy and use some line that sounds like it came straight out of a pick up artist guide. If a guy is acting like he’s too cool to talk to you, leave him alone. He’s not interested, at least for right now. Following him around the bar will probably just get you labeled as a stalker and probably thrown out by security. Instead, go back to whatever you were doing and you might be pleasantly surprised later when he makes an attempt to get your attention. Score! You win! The fastest way to creep a guy out is by sharing too much information too soon. Let him lead the conversation. There is no reason to share the details of your doctor’s appointment earlier simply because you can’t think of anything to talk about. Above all look good and smell good (guys tend to care about that). If you see any of your friends failing at flirting, have a talk with them and show them this article.